The hefty hardcover deserves instant classic status for two reasons: like no other tome before, it explains through original archival material why the mega Wall Street banks are coddled by Washington and have been allowed to survive a century of public looting – because they are considered an essential financial component of the U.S. war arsenal. The book also brings into crisp perspective the history of mega banks like JPMorgan Chase and Citigroup, their variously esteemed and despised titans of yesteryear, and why the country is reliving the mistakes of 1929 today. Prins makes us all insiders as we read the private notes from Presidents scribbled to the historic Wall Street figures of their day. There is enlightening detail provided of the lead up to the 1929 stock market crash and the Great Depression. The foundation was laid, brick by brick, stone by stone, in a manner so identical to the lead up to the 2008 Wall Street crash that it gives one pause as to whether we have yet seen the worst of the aftermath. The massive issuance of troubled foreign bonds of that era is comparable to the Initial Public Offerings (IPOs) of Chinese and Russian companies that trade on U.S. stock markets today – companies the investing public know very little about in terms of the quality of their purported earnings. Today, we read that most members of the U.S. House of Representatives (the so-called “People’s House”) are millionaires. 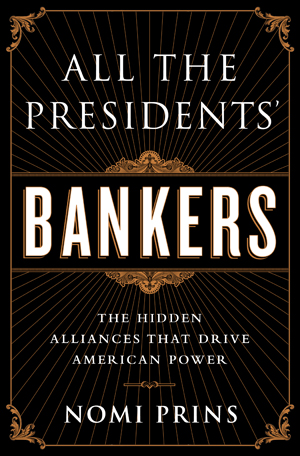 Prins reminds us that when Herbert Hoover was elected President in 1928 as the “first millionaire to reach the White House,” he promptly filled his cabinet with fellow millionaires. (Millionaires filled six of his top ten posts.) The Nation magazine wrote at the time that Andrew Mellon, Hoover’s Treasury Secretary, was “one of the four richest men on this continent,” and Hoover kept him on from the Harding and Coolidge administrations, where he had served consecutive posts as U.S. Treasury Secretary. The Nation said of Mellon: “During eight years he has so administered that office that $3.5 million in refunds, credits and abatements of income taxes has gone to wealthy individuals and corporations.” Mellon’s own Aluminum Company of America had escaped prosecution and received large refunds of taxes. Today, we have a U.S. Treasury Secretary, Jack Lew, who was Chief Operating Officer of the unit of Citigroup that collapsed the bank and who received a $940,000 bonus from taxpayers’ bailout funds on his way out the door. The similarity of today’s JPMorgan Chase taking over Bear Stearns and Washington Mutual during the Wall Street crisis and merging with Bank One in 2004, concentrating risk in opaque mega institutions also resonates with 1929. Prins writes: “By the fall of 1929 Chase had acquired six major New York banks, making it the second largest private bank in the world, next to Mitchell’s National City.” Mitchell’s National City is today’s Citigroup, parent of Citibank. And Mitchell’s compensation was almost as obscene as his contemporary counterpart at Citigroup – Sanford (Sandy) Weill. “In 1928 and 1929,” writes Prins “Mitchell earned $1.2 million in total compensation, two hundred times the average American’s salary of $6,000.” Prins notes that Weill received some of the largest paydays in corporate history, including $220.2 million in 1997 by exercising stock options on top of $49.9 million in salary, bonus, restricted stock and options. The Fed and the bankers have created the exact illusion today: a stock market setting new highs on the zero-bound range of interest rates enforced by the Federal Reserve and highly leveraged stock speculation enforced by the bankers as the economy stagnates and long-term unemployment grows. The headlines we printed just this past Friday at Wall Street On Parade on the growing deflationary trends in Europe should send a chill through every student of financial history and send people scrambling for this book. On May Day 1930, Prins ominously reminds us that President Hoover declared “We have now passed the worst and with continued unity of effort we shall rapidly recover.” Over the next two years, the economy and Wall Street were crushed. The end game of this, says Prins, was that it “stoked the market” in a manner “not unlike the one that prevailed during the ‘money trusts’ era at the turn of the twentieth century, when the Morgan group of financiers, by virtue of their joint position atop various firms, could buy securities from one of their firms concocted by another, providing the illusion of heightened demand, which, in turn enticed more external investors.” Pump and dump, in other words. The Glass-Steagall Act was fully repealed in 1999 with the passage of the Gramm-Leach-Bliley Act – in no small part as a result of the actions of Weill and Dimon and the Clinton administration. That brought to mind the reality of just how far our Congress has sunk from the inquisitive minds of the 1930s. The U.S. Senate of that era spent years investigating all aspects of the corrupting influences of the Wall Street banks, including stock exchange practices, and the Senate’s findings made front page headlines for years. Five years after the greatest Wall Street crash since 1929 to 1932, stock exchange practices as well as any ongoing, coordinated Congressional investigation of the big picture, has yet to happen. And, each day we learn of new collusion – from rigging of the interest rate benchmark, Libor; to foreign exchange rigging; to rigging of commodities markets, to gaming stock exchange trading. Where will it all end? Let history be your guide.